We uphold our exceptional reputation in the cleaning business by taking pride in everything we do. We Also Provide Residential Cleaning Services. Contact Us to learn more and receive 10% off your first house cleaning. CLA Commercial Cleaning has professional porters and matrons who take care of routine logistics leaving you to focus on your business CLA Commercial Cleaning's porters and/or matrons will create a smooth, organized, and efficient environment in which your employees can get on with their work. Any other type of janitorial or custodial duty you require. Our personnel are all screened and security checked before they work in our name as well as trained in the right safety procedures to follow in the event of an emergency. CLA Commercial Cleanings' janitors and matrons are also trained to keep busy at all times because we know thatthere is always some little job just waiting to be performed! With our experienced, bonded, certified and insured janitors and matrons your New York or Tri-State office or business will run smoothly. Efficiently and without the last minute issues that add unnecessary stress to your workload. 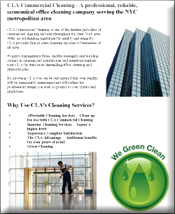 Let CLA Commercial Cleaning help your office acquire that streamlined, professional touch. Contact us online today to find more about our janitor and matron services. Or call 646-532-3750 for more information. CLA Commercial Cleaning – one of New York's finest and most affordable office and business cleaning, window cleaning, carpet cleaning, floor waxing and finishing companies, janitorial and porter service companies.